A luxurious yet easy to make upside down apple cake with caramel and whole baked apples. I was 19 years old the first and until recently only time I ate this apple caramel cake. 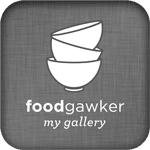 I liked it so much that it stayed with me for all these looooong years… I thought about it many times, but never knew the recipe and somehow never came to the simple idea of doing a search on Google. But recently, during one of those (guilty) hours one spends on Pinterest, I saw the picture of this luscious apple caramel cake. As soon as I noticed that the name of the cake was written in Romanian, I knew I found my cake. That was it! 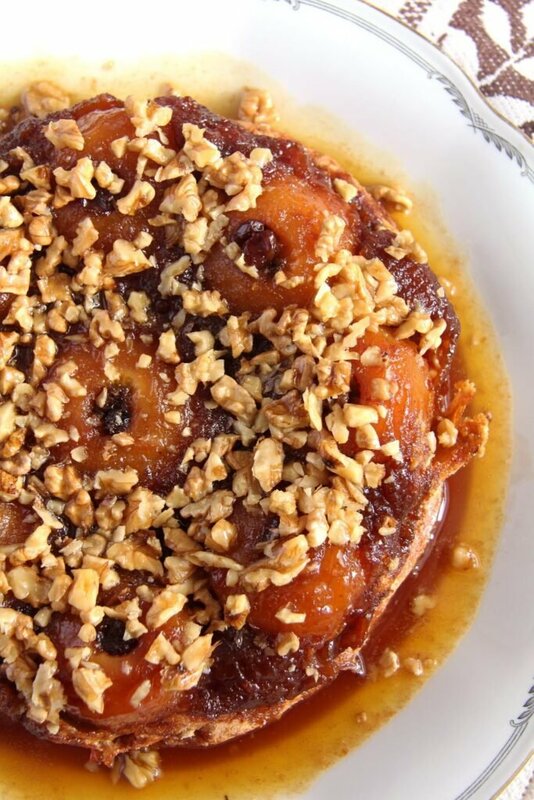 Those delicious baked whole apples, oozing in caramel and surrounded by that pancake-like, sweet batter. 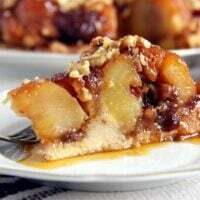 One day later I already had all I needed and I baked the upside down apple caramel cake. It was even better than I remembered! It is overly sweet (lots and lots of caramel), but soooo delicious! 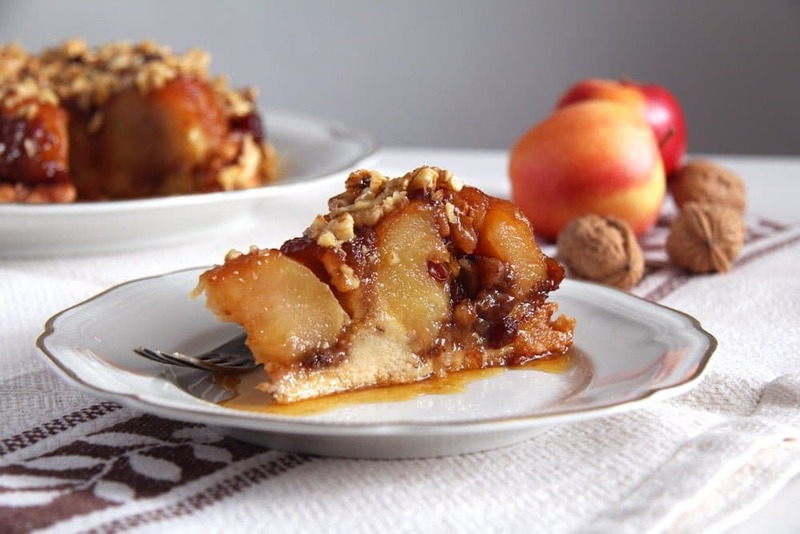 If you like baked apples you will love this cake even more. 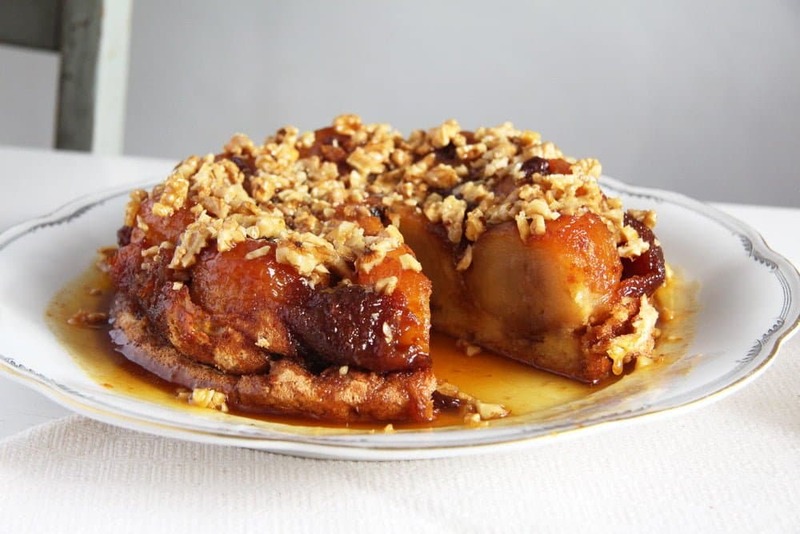 The apples have the perfect consistency, they are filled with raisins, walnuts and cinnamon and the batter, which gets absolutely soaked in that caramel, is just amazing. Although it is a simple sponge cake batter, the caramel makes it almost like a pancake in taste and texture, you will love it! Untypically for me, I included a few step-by-step pictures, they are not particularly pretty (I really don’t have the patience of taking pictures while baking or cooking), but I thought that, in this case, it would be easier to have a picture to explain the procedure better. 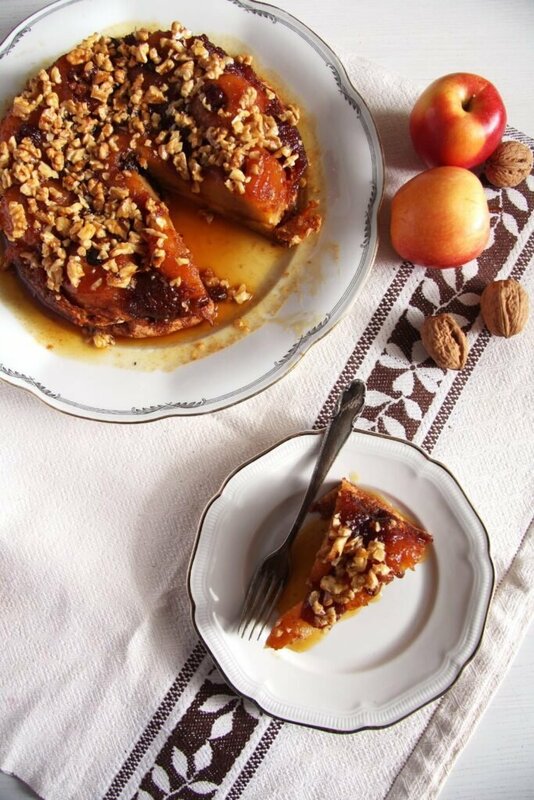 I am especially thinking about the way of spreading the caramel in the pot, it was easy for me because I remember my grandmother doing the same thing when making Romanian burnt sugar cream, but I thought that describing that using just words would not be explanatory enough. I used a very old pot to make this cake, as caramelizing sugar in it did affect its whiteness a little bit. Don’t use a non-stick pan, the caramel will not stick to it, just take the oldest enamel pot you can find. Turn the upside down apple caramel cake out of the pan immediately after baking it, it works wonderfully, but if you leave it too long in the pan, the sugar will harden and the end result will not be so pretty anymore. 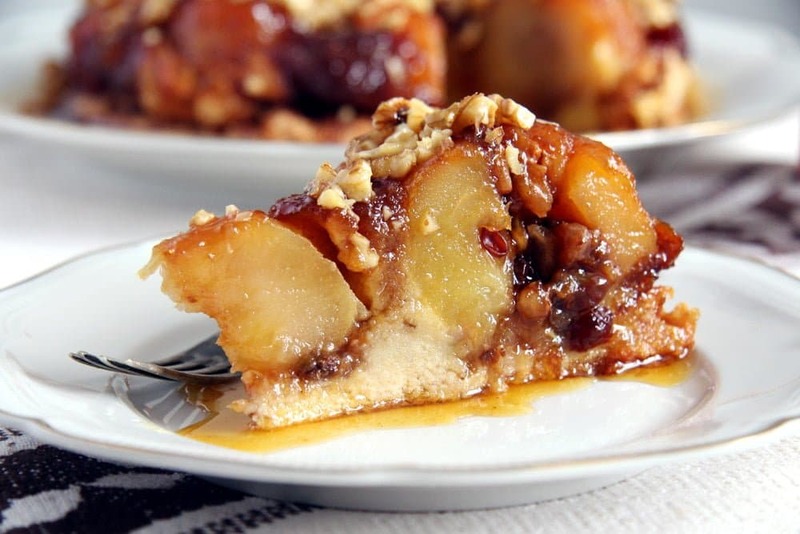 You can enjoy the upside down apple caramel cake either lukewarm or at room temperature. To tell you the truth, I liked it best the next day. The batter was then really infused with the caramel and got this amazing pancake-like consistency. You can serve the cake either plain or with unsweetened whipped cream. Do let out the sugar when whipping the cream, the cake is so sweet, you will definitely not need extra sugar. Serving the apple caramel cake with vanilla ice cream sounds good too, I haven’t tried it myself but I am convinced it would be great. Next time! October is here, for me the perfect time to start a new series on Where Is My Spoon, a series dealing only with apple cakes. I start this series with my personal favorite apple cake, but don’t worry, the coming ones will satisfy other tastes as well. 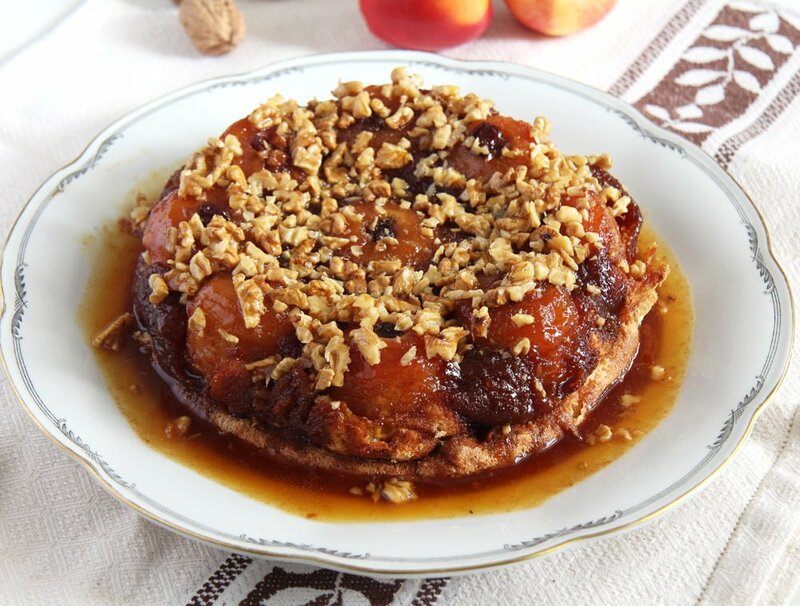 Eight very different apple cakes, I am sure each of you will find the one they like best. Place the sugar in the pot (about 22 cm/ 9 inch diameter). Shake the pot to spread the sugar evenly and place on the hob. Don't stir until the sugar starts to caramelize at the bottom, then start stirring slowly with a wooden spoon until the sugar caramelizes completely and has a deep brown, nice color. Don't let it get too dark or it will taste burnt. Hold the pot's handles and turn the pot round, very carefully, to spread the caramel all over the place including the walls of the pan. Please be very careful, the sugar is very hot! Set aside until the sugar will harden and start getting some cracks. In the meanwhile prepare the apples. You will need 6 to 9 apples, depending on their size. They should fit in the pan comfortably. Peel the apples and remove the core leaving the apples whole. I have a special kitchen utensil for this purpose, but you can use a long, thin knife. Turn the apples in the lemon juice to prevent them from browning. Mix together the jam, walnuts, raisins and cinnamon. Fill the holes in the apples with this mixture, push the mixture down the hole with your finger. 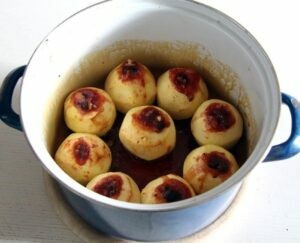 Place the filled apples in the prepared pan. Bake the apples for about 30 to 40 minutes, depending on their size. Pierce them with a fork after this time, they should be almost done, not too soft yet. To make the batter, separate the eggs. Beat the egg whites with a pinch of salt until stiff. Add 3 tablespoons of the sugar little by little and continue beating until the egg whites are stiff and glossy. Whisk the egg yolks with the remaining 3 tablespoons sugar until pale and fluffy. Fold the egg whites in the egg yolks and sieve the flour on top. Fold in carefully. Pour the batter over the apples and continue baking for about 25 minutes or until the batter is golden brown and a skewer inserted comes out clean. Immediately release the cake from the walls of the pan with the help of a knife. Place a platter over the pan and invert the cake onto the platter. That sounds more difficult than it is, it actually worked perfectly, better than I thought it would. To make the caramel sauce place 150 g/ 2/3 cups sugar in a pan. Shake to spread evenly and let stand until it starts to caramelize at the bottom. 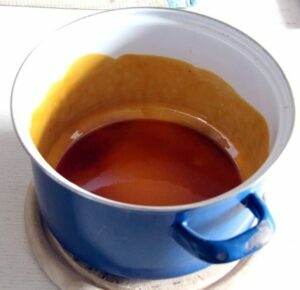 Caramelize completely while stirring gently until the nice brown color is reached again. Add the cubed butter and stir to incorporate. Slowly add the water and continue stirring until the mixture boils. Let simmer for a few minutes, while stirring all the time until all the sugar clumps are dissolved and the sauce has thickened slightly. Add the walnuts, coat them in the sugar sauce and top the cake with this mixture. Let the extra caramel sauce ooze around the cake. Let stand until the cake is lukewarm and serve in this stadium with vanilla ice cream for instance or let cool completely and serve with unsweetened whipped cream. Looks incredible Adina!!! You are so talented!!! I am delighted and thanks for the feedback. A wonderful cake! Mulțumesc pentru rețetă.? What a wonderful fall cake! I’ve never seen anything like it, but it is beautiful and the flavors sound incredible! wow it swims in caramel sauce…no wonder it’s HEAVENLY! I know!! I got hooked on to pinterest recently its quite addictive right and helpful too. THis cake looks divine!! What a beautiful apple cake! I make regularly only two apple cakes (one is a very thin tart, so not really a cake… but it’s my favourite by far), so I’d be delighted to see your creations. I can’t believe this has whole apples in the cake! What a treat. This looks really amazing! how unique! i really like that this is mostly apples, with a little bit of cake. very appealing dessert, adina! Now this is an apple cake that I can really, really, really sink my fork into! What a treat!!!! Adina, ma bucur ca acest tort ti-a amintit de dulciurile din Romania, chiar daca acum esti pe alte meleaguri. This looks so good. My husband LOVES French tarte tatin so I’ll have to give this a try.